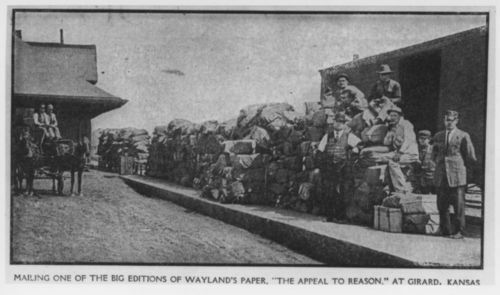 This photograph shows bundles of the Appeal to Reason, newspaper ready for mailing at the depot in Girard, Kansas. The Appeal to Reason was an independent newspaper first published in Kansas City Missouri and later in Girard, Kansas, by it's founder Julius Wayland. The political publication consisted of three to four pages of articles and headlines about Socialism in America. Curriculum - The Kansas Journey - Chapter 8: Reform Movements: "It Happens First in Kansas"